'Clown Pants' (Thomas Silvers, R. 2004). SPEC-X, 23" (58 cm), Early bloom and rebloom. 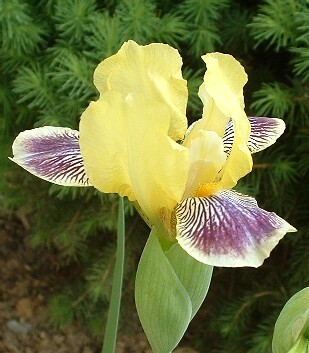 Standards pale yellow (RHS 5B), speckles on claw; style arms pale yellow (5C); Falls pale yellow ground overlaid with purplish haft striping blending into burgundy (187A) on lower half of Falls, rimmed pale yellow; beards yellow orange (15A), end slightly lighter, hairs tipped purplish; slight fragrance. I. variegata, Beardsley clone X I. suaveolens﻿ var. mellita. Iris City 2006. Hybridizer's Comment: Easily pod and pollen fertile with most other 24 chromosome diploid beardeds. Produces variable offspring. 'Clown Pants' has never bloomed in the Fall (anywhere that I'm aware of), but often does send up repeat stalks several weeks after the main flush is finished. It has produced some offspring that do bloom in the Fall, including 'Easy Smile' and 'Cricket Song'. jpg BHP_1161-X2_clown_pants.jpg manage 97 K 21 Feb 2016 - 07:58 BrockHeilman Please contact Brock Heilman for image use.